This photomural of Jackson Lake is one of three such murals introduced by Foto Murals of California in 1948. Each mural was available in a black and white, or sepia version, and measured approximately 90×180 inches. Each photo was captured by a world renowned landscape photographer, and because of a special process developed by Foto Murals, each could be purchased for the low price of $29.50. 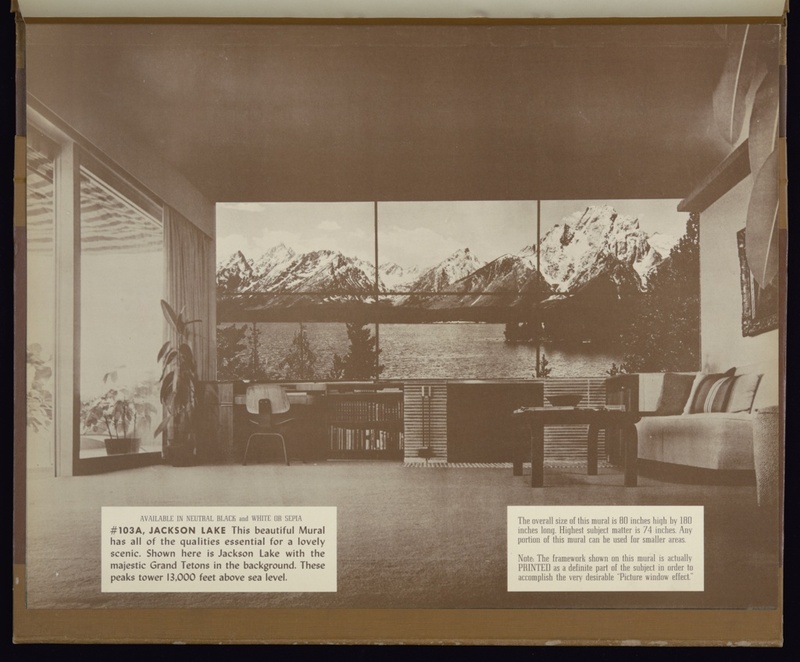 I chose to blog about the Jackson Lake mural as it has the mullions printed over the scenic view, creating the effect of viewing the lake and Grand Tetons through a picture window. Each of the murals is presented in situ with beautifully appointed rooms, this one in mid-century modern. When viewing these murals as shown in the black and white photographs of the interiors, each appears to be an actual glorious view seen through a large picture window. And in the case of Jackson Lake, the printed mullions heighten this effect. I have always wondered what the experience would be to step into a room and viewing this mural set within the living color of the room’s furnishings. The contrast between the monochrome and full-color might actually enhance the effect, drawing one’s attention to the artistry of the photo, as well as the sublime beauty of the natural environment. The use of photomurals as wallcoverings goes back to about 1931. A review of a MoMA exhibition in 1932 referred to photomurals as a “most promising new type of mural treatment.” Photomurals printed in full color began to appear in the mid-1950s, initially in a smaller scale, sold alongside the full-size black-and-white murals. Alden Jewell Edward, “Photography and Walls,” New York Times, May 22, 1932.